Vodka – Price reflects quality? One question I have been getting a lot of is ‘does the price of a bottle of Vodka ‘automatically’ help guide you to the good stuff’? First up, why the question? I think it is because vodka tasting is still not all that widely understood or has been experienced by many people. Most people I talk to firmly hold the view that vodka is tasteless. So why then should you worry about spending 9 bucks or 30 bucks, or even 100 bucks on a bottle of tasteless water? Well, as you gathered, vodka is not tasteless and as I said in my first blog, if you are not mixing it, or slamming it, if you are actually drinking it for enjoyment, not just to ‘get buzzed’, then quality matters. Back to the original question. Does cost reflect quality? Not in my experience, and not according to a few quotes in this article from the New York Times (picked at random from a Google search on the topic). Information Resources now tracks six categories of vodka: value (under $6); popular ($6 to $9); premium ($9 to $15); super premium ($15 to $22); ultra premium ($22 to $40); and luxury (more than $40). Ivan Menezes, president of Diageo North America, says sales of his premium brands, like Smirnoff and Captain Morgan, remain strong. But he says sales of more expensive spirits, which grew by double digits in years past, have slowed markedly in recent months to single-digit growth. During that same period, budget brands, long in decline, have started growing again. So in a nutshell, people cant afford to drink good stuff when times are a little tough. (My question is how much are people drinking if they can’t stretch a good bottle to be the same value as a cheap bottle!!! This right here might be the real cause for the core question!). So, they are turning to the bottom shelf to try and find some solid reliable cheaper vodka. Nowhere was this more evident than in the vodka category. By government definition, vodka is supposed to be a neutral alcohol without distinctive character, aroma, taste or color, and some believe that the differences among vodkas are so subtle that only connoisseurs can distinguish them. But a marketing genius and liquor baron named Sidney Frank decided in 1996 that with the right story line and marketing panache, Americans would buy steeply priced vodka. He came up with a refined name, Grey Goose, and a sleek bottle. Most important, Mr. Frank, now deceased, decided to charge $30 for a bottle of Grey Goose, nearly twice as much as the most popular imported vodka, Absolut. It was a phenomenal success, so much so that in 2004 Mr. Frank sold Grey Goose for $2 billion to Bacardi. So, he simply thought, if people think cost = quality, its a done deal. Sadly, it seemed he was right…. But…. And yet several impartial taste tests have found that the cost of a bottle of vodka doesn’t necessarily translate into better taste. In 2004, Slate magazine crowned a Polish vodka, Chopin, as the best; it cost the same as Grey Goose, which it described as unremarkable. The next year, a panel at The New York Times determined that Smirnoff, at $13 a bottle, was better than its pricier rivals. No, the cost of the bottle is no reflection on the taste (quality). Thankfully (?) I found this one after some many miles on my Vodka journey. It would have been a shame to have tried it in the early days and not really appreciated just how amazing this drop is. Incredibly smooth and a very very very unique taste…. I almost want to say it is a little salty…. They soak the sugar cane in deep ocean water. And they don’t batch distill it, but rather use very long columns and use a continuous process. The result is amazing. I am seriously looking forward to trying my next bottle (in around 2-3 weeks). (No, I did not post the photo after drinking it… I love how this bottle sits on its side and so thought it would look more interesting if I tilted the camera). Anyway, a few of you have emailed me off line and asked what is a good solid Vodka. So, here then is my daily drinker…. 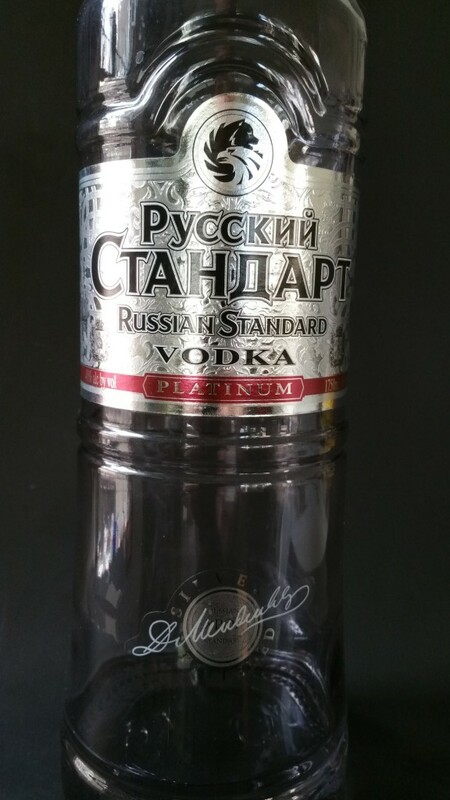 This is a bottle of Russian Standard Vodka. There are three levels of this stuff, the stuff that suggest you start with is, The Standard. This bottle is one level up from that, it is the Platinum. The last is Gold. I have not yet had the gold, but am pretty excited to have a crack at it. It just so happens that I do not have a bottle of the Standard in the house at the moment to photograph, I have been enjoying this Platinum for a while. The Standard is a solid 3 /5. I almost want to put it at a 3.3 / 5 but honestly, while the Standard is a great intro to a drinkable Vodka, you really need to be keeping it in the freezer. The Platinum is a big step up. It gets you into the 3.75 / 5 range. Very nice. Nice enough to just keep this stuff in the fridge. Really looking forward to trying the Gold at some stage (soon!). And, to save you the work, I checked, you can get it in Australia! They also have the gold, but I did not see the Platinum…. It also looks like you guys are paying a lot more for it downunder…. We plonk down around 20 bucks tops for it here. We will keep an eye on the Dan Murphy Vodka list and see if we can find a nice 3/5 for a little less coin (but wow, he sells some really crap Vodka by the look of it!). So there you have it. Not a bad way to start the list… my current favorite daily drinker! Cheers, or should that be tva-jó zda-ró-vye (your health!). I rightly contribute losing 20ish pounds (9kg) purely by swapping beer for Vodka. What surprised me, is as I explored this, to me, unknown drink, I have found a new world of taste and enjoyment. As such, I would like to share my Vodka journey with you lot. Not only did I lose weight, but I just feel better for not having the carbohydrate and grain intake. (And if you accidentally over do it, the hangover is (for me) totally non-existent. Not that I would know anything about that of course). Ok, so hears the most important thing about Vodka. If you have had it in the past and not enjoyed it, it is because you are buying cheap stuff. It is as simple as that. Time and time again, I have had people over (shocking I know) and asked them if they would like to try some Vodka. The answer is the same. “The stuff is nasty, I tried it once and vowed never again”. I am not for breaking vows, but if I can, I offer to open their eyes. Every single person has taken me up, and every single one has been amazed and impressed with the difference. Second most important thing about Vodka…. You sip it. The only reason to slam one down (shooting shots, or whatever your teenage self has memories of) is because it is so cheap and nasty that you want the taste part of it over as soon as you can and thus get it inside you to get the kick. If this is the case, and you really really want to slam it down, then please let me know, and I will adjust my tasting session. (In other words, you don’t get to try the good stuff – and I pour you half or less sized servings). So, shot glass, slightly over sized, ice cubes (I am looking at getting a special small ultra filtered water table top ice cube maker – the vodka warms up too fast here without the ice) and always keep the good stuff in the freezer. Fridge at the very least. With that, you are good to go. Seriously, good Vodka is really really enjoyable. It is not uncommon for us to enjoy a shot glass size for some 20-30 minutes. Tough to answer. Tell me what a rose smells like…. You see my point. What a wine to me and the same wine to you tastes like is hard to describe, but here again is a very important thing…. Matt, like most people, thought that Vodka was tasteless. And, even more to the point, the better the Vodka, the more tasteless it was. Tasting. There are three senses involved in a tasting of vodka: smell, sight and taste. Smell. Smell the vodka as you briefly swirl it about in your glass. A good vodka will have a creamy, sweet or grainy odor. A bad vodka will smell medicinal or “aggressive,” with a strong odor of ethyl spirits. Sight. Hold the vodka glass up to the light and look at the liquid’s clarity, texture and luminescence. A fine vodka will have a thick and creamy texture when frozen; it may also have a bluish or yellowish tint. One expert Russian taster noted that vodka is valued “not just for clarity, but for a crystalline lustre, an internal energy.” [Ben – I agree with this, a good one does not look like water, it has a shine to it]. Taste. It all comes down to this. A good vodka should taste soft not hard, creamy not watery, smooth not rough. It should not be bitter or caustic, it should not burn your palate. It very much does has a taste and there is a large variation between brands and even within levels of the same brand. As for the taste…. It is very unique. I can not really put a finger on it. 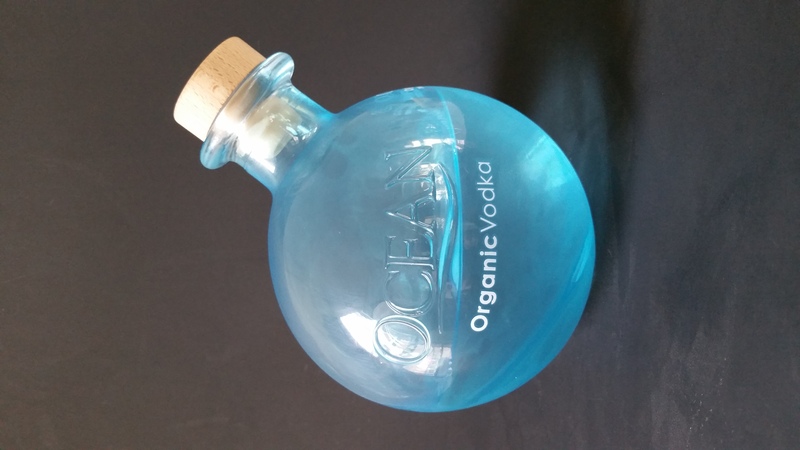 Most people have had say a red wine and so we can talk about wood, smoke, oak, earth, pepper and so on, whereas describing Vodka is a lot harder since it is a very unique taste…. The grain is the most obvious, but I have not tasted anything else like it, so unlike red wine, I can’t talk about common tastes that we all know. Here is my scoring system. 0 / 5 Mouth wash. Worse, engine degreaser. (Mostly likely, if you have tried it in the past, this is the stuff you had). Most likely flavoured. Do yourself (and me) a favor and pour it down the sink. 1 / 5 Mixer at worse. Add it to your orange juice rather than waste the money. 2 / 5 Suffer through it. At least it barely burns at the end. 3 / 5 This is drinkable. Not as complex or as interesting as the good stuff, but enjoyable. 4 / 5 Ok, now we are talking. This is the stuff I really enjoy. 5 / 5 We have not found one yet, but many have come close. Smooth, tasty and a lovely velvet finish.